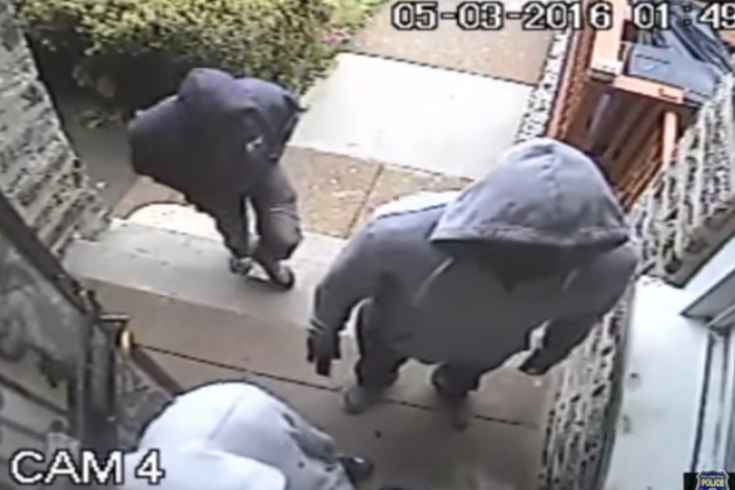 Philadelphia police are looking for four men they say were caught on surveillance video breaking into a home in Olney and then stealing various items earlier this month. Four men, at least two of them armed with handguns, broke into a home in Philadelphia's Olney neighborhood on May 3; stole jewelry, clothing and a laptop; and then fled when a male resident returned home, police said. Much of the incident was recorded by the home's surveillance cameras, and Philadelphia police released that video Wednesday. The incident took place at 1:15 p.m. on May 3 in the 100 block of East Doncannon Avenue. Police said the men had taken turns walking past the front of the residence and waiting for the victim to leave. Surveillance video shows that one of the suspects first tried to pry open the rear door to the property, police said. When that failed, they turned their attention to the front door, where they were briefly scared away by the victim's burglar alarm. The men returned shortly after, forced open the front door and entered the residence, police said. According to authorities, cameras inside recorded the men rummaging through the house, stuffing items into bags and then leaving through the front door. Police said the suspects fled after being alerted by a lookout across the street that the residents had returned. They first attempted to leave through a door in the basement, police said, but when they could not, the suspects exited through the front, pointing a handgun in the victim's direction as they walked past. The victim told police the suspects stole a gold chain with a two-piece charm, an Asus laptop, a handbag and various items of clothing. The total value of the missing items is $6,400, investigators said. All four suspects are in their mid-20s, police said, and were wearing hooded sweatshirts during the alleged robbery. The men were seen entering a 2004-2009 gray or silver Nissan Quest minivan. Police warn anyone who sees these suspects to not approach them and to instead contact 911 immediately.